Our west-coast location means we can take orders as late as 6pm EST, and still get them out that day! 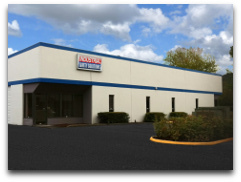 The Portland metro area has become a center for innovation and technology, and the industrial label printing industry is no exception. We are proud to call the Northwest our home, and offer convenience to our customers, around the world, with rapid shipping and response times. Our goal is to serve you. We offer quality industrial label printers and supplies, for much less than you'd expect. The SafetyPro line is formulated from the ground-up to be long-lasting and cost-effective. We focus on the supplies and equipment that you want, need and use, so we can "trim the fat" that other companies have, and that you end up paying for in the end. 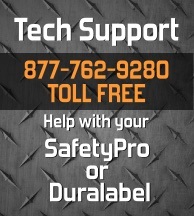 We provide free instant phone technical support for all of your safety label and sign making projects. Our outstanding support begins with your first toll-free phone call to 1-877-762-9280, and continues throughout your entire project. Full-time, fully qualified technicians are available during our extended business hours, with detailed troubleshooting and resolution techniques specific to the sign and label printing industry. We are ready to help get you printing quickly. Our OEM relationships give us access to a virtually unlimited inventory of labeling equipment and supplies. Our on-site warehouse is stocked with a full lineup of vinyl labeling tape in over 70 colors. This extensive inventory means we can usually ship your order for immediate delivery. With extended business hours, we can get your rush labeling shipment out today! Trade-in options for DuraLabel Pro owners! If you have a DuraLabel, DuraLabel Pro, DuraLabel Pro 300 or a Brady printer, with hard-to-find or expensive supplies, we can offer you generous trade-in value toward the purchase of a new label or sign printer. We may be able to offer you a direct trade for your DuraLabel Pro, at no cost to you! Contact us today for more details on how you can maximize your savings by trading in your DuraLabel Pro printer. If you're having a problem with your label printer, our in-house service technicians can help diagnose the problem and determine the quickest way to get you printing again. If your machine should need warranty service, we can facilitate the processes by shipping out loaner or replacement machines the same day. We also offer generous trade-in options for outdated or out-of-production label machines. Your comments are valuable to us. Please let us know if there is something you are looking for that you did not find on our website.